Manuals may not be classic literature, but they are the place to begin when setting up a home theater. They introduce you to each element, and guide you through the steps you will need to take to do it right. If you want true surround sound and Dolby, you will most likely need and optical and coaxial audio cable in addition to the usual red and white cables. Default settings on your Blu-ray or DVD player may give you a picture, but to ensure that the picture isn’t elongated or squat you want to calibrate the picture settings for your specific TV. These are most frequently labeled 4.3 for a standard television, and 16.9 for a widescreen TV. Even after setting things up, your disc player may not be set to give your receiver the best audio signal – even with the correct settings. In your disc player’s setup menu, choose the setting that is usually called “bitstream” or “Dolby Digital.” That will give you the surround sound you want. Dave Bar, writing for Crutchfield Labs says “…most DVD’s and some Blu-ray discs don’t automatically have surround sound set as their default playback mode….In order to get a disc to output surround sound, go to the disc’s main on-screen menu by pressing your player’s ‘Disc Menu’ button” and select ‘Audio Setup’. If you follow the prompts, you should be able to select the best surround sound for your player. 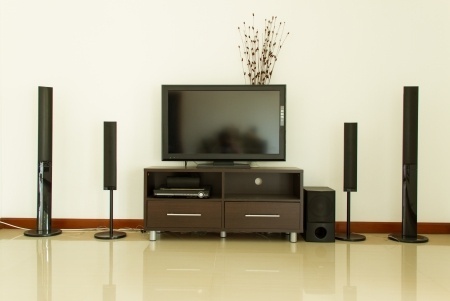 The location of your subwoofers will determine how loud and balanced your sound is. If they are too close to room boundaries, like walls and corners, the bass may get distorted and too loud. Placement is, of course, dependent on how much room you have to maneuver, but remember that sound is relative to location of these elements. Our ears are very sensitive, and while you may not always be able to indicate the subtle nuances of what you are hearing, you do want to hear sounds as if you are really in that concert hall, or on that playing field. A simple analog decibel meter can help you calibrate your speakers so that sound is as true as it can possibly be. Home theater setup need not be terribly complicated if you know what you’re doing, and there is an order to the steps you take that will make setting it up less frustrating. Using all the guides that come with your system will assist you, and keeping these few things in mind will make the experience give you a feeling of accomplishment. What are the Advantages of a Universal Remote?